Of course it’s possible to celebrate your birthday in a museum! We can organize various exciting and creative parties for children from 7 to 12 years of age. All the parties begin with a creative workshop and after a break we introduce children to the museum’s collection in an enjoyable manner. Depending on the age of the children, it can be a treasure hunt or another sort of game. A fun way to learn more about the history of the museum and books..
It’s no surprise that paper is an important part of a book museum. 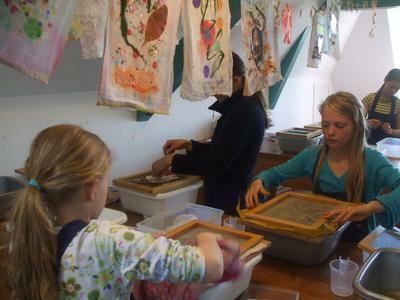 During the programme ‘Paper making’ you will be able to create your own paper. There’s quite a lot involved before you have your self-made paper in your hands; little snippets, flowers, glitter, feathers or threads can all be worked into it. The paper has to dry overnight - we’ll send it on to you afterwards. In the attractive, mysterious attic of Museum Meermanno is a replica of a medieval scriptorium. Here, dressed as a monk, you can experience how monks used to produce books in their special writing workplace. You will learn how to write with a real goose quill pen. It’s possible to make your work even more beautiful with gold leaf. After the party, you can take your own handwritten page home with you. Watch out! Things jump out at you from a pop-up book. These books look very complicated, but it is not as difficult as it seems. 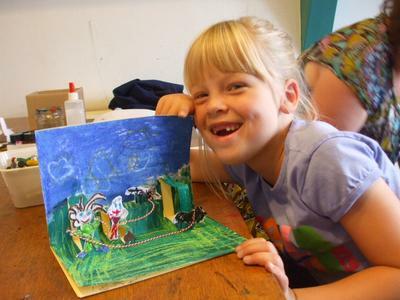 During the Pop-up party, you will learn how pop-up books are made and then can have a go at it yourself. Museum Meermano has its own printer’s shop with different sorts of old printing presses. The birthday boy or girl can set his or her own text with loose lead letters and then print the result. You can then use large wooden letters as a stamp to decorate your text, for example, with your name in all sorts of pretty colours. A birthday party lasts two hours and costs €10.00 per child. For more information or to make a reservation, please send an email to reserveringen@meermanno.nl.